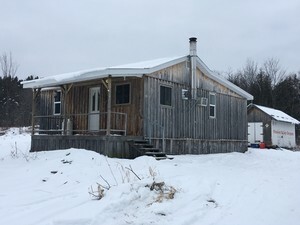 The stunning 900 sq ft smoke-free cabin boasts a huge front porch, vaulted ceilings, pine walls, Amish made stove and is fully furnished, which includes a full kitchen and BBQ. It is able to accommodate 8 people (2 queen size beds and 2 sets of bunk beds). There is a separate shower/washroom building with a composting toilet and the cabin is completely off-grid. However, if hunting, the property can only safely accommodate 5 hunters at any given time. Click on the link to see more pictures! This quaint 600 sq ft smoke-free cabin is finished in beautiful pine. 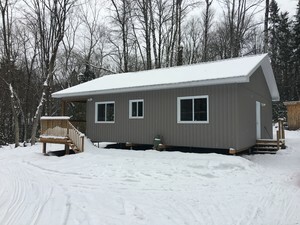 The cabin has 2 bedrooms (2 twin beds in each room) and comes with a full kitchen and BBQ. A solar power system is wired throughout. Click to see more pictures!